If Wilco continues to expand their live show at the same rate that the sets have expanded in the last few years, the 2014 Wilco tour will consist of five hour shows with 60 songs. While that seems absurd, its almost inconceivable that in an era of 50-minute headliners, Wilco regularly plays for over three hours with an almost ridiculous (thirty-eight on this night) number of songs. In April, we recorded both shows at the Wellmont Theatre in Montclair New Jersey and featured the first night a few days after the show. Unfortunately, the recording of the second show was technically problematic, and the significant post-production meant that it got pushed to the back of the nyctaper queue. Although the editing was a chore, it was a pleasure to revisit another epic Wilco show in the NYC area. 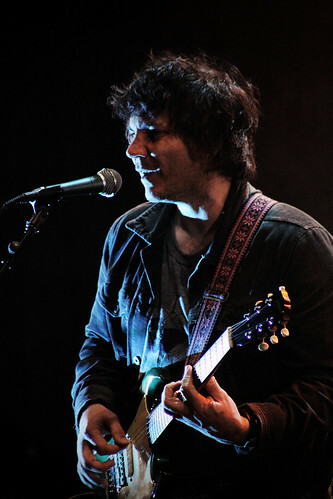 For this tour, the band performed a brief “acoustic set” mid-show, which gave them an opportunity to trot out some oldies. This particular night, several Being There tracks were played, along with rare nuggets like “Laminated Cat”, “Candyfloss” and “Airline to Heaven”. The set closed with a two-for of Big Star covers, in tribute to the death in March of the legendary Alex Chilton. The sound quality of this recording is below the usual standards of this site. We offer this show because of the large number of requests for a recording, and because this date does not seem to have been taped by anyone else. There were two major losses of the right channel during the first half of the set — one lasting 20 minutes — and those have been patched by replicating the left channel. There were also many peaks of close-clapping, the most egregious of which have been isolated and reduced. This particular venue has also not achieved its maximum sound potential and frankly the talented Wilco sound crew could only do so much. With those caveats, enjoy! If you email nyctaper for access to this recording, we expect that you will PLEASE SUPPORT Wilco, visit their website, and purchase their official releases directly from the band here. Once again, thanks so much for releasing this great concert! I’ve been DYING to hear their Big Star covers again! Appreciate all that you do for the website! Awesome! I’ve been hoping this recording would show up, and even if it’s not up to the usual NYC Taper standards, I really appreciate it. I’ll be making my first donation to the site this morning. Thanks so much for the show. Yeah the sound in this place was not so hot. I thought the band reacted well the second night. Jeff was on his acoustic most of the night. And they played with a much more relaxed feel, hence all the ‘Being There’ tracks. I really enjoyed both nights & was so glad to have reserved balcony seats for this night. Nearly 6 hour of WILCO in 2 days, I was glad to sit. I thought it sounded much better from the balcony too. Thanks again.